Shaker Village of Pleasant Hill in Harrodsburg, Kentucky is the site of a Shaker religious community that was active from 1805 to 1910. The Village is America’s largest restored Shaker community and is a registered National Historic Landmark. Thirty-four carefully restored buildings and 3,000 acres of preserved farmland are the result of a preservationist effort that began in 1961. Guests can wander over the grounds and inside most of the buildings. Costumed interpreters tell the Shaker’s history and explain their way of life. Artisans demonstrate some of the skills of the Shakers, such as weaving, woodworking, and broom making, all of which were money-making industries for the communal group. No Shakers now live on the property. In fact, one interpreter explained that only three Shakers live today in the United States. Yet, the Shakers played an important role in American religious history, developing the longest lasting communal society. According to an interpreter in Centre Family Dwelling, Shakers started in Manchester, England in the 1700s when Ann Lee, considered the “mother” of their religion, had a vision that convinced her Christ had returned to Earth and was beginning His 1,000 Year Reign. She—and others with like minds—wanted to live in heaven on earth. They were persecuted, even arrested, in England when they stood on street corners, chanting and shaking their clothing to rid themselves of sins. Their name comes from their “shaking and free-form dancing” when they believed the Spirit moved them. Seeking religious freedom, the Shakers sailed for the colonies in America in 1774. By 1805, eleven Shaker communities had been established in New York and New England. At the same time, the Kentucky Revival, characterized by large camp meetings, long-winded Protestant preachers, music and dancing, and speaking in tongues, appealed to the emotions of Shakers. Lexington, Kentucky, had a population of 2,500. During a revival meeting, the number swelled to 20,000, people coming mainly from the Ohio Valley. In January 1805, Lucy Wright, the head of the Shakers’ parent ministry at New Lebanon, New York, decided to send three missionaries west to find new converts. Traveling more than a thousand miles, most of the way on foot, they joined the pioneers then pouring into the western lands by way of Cumberland Gap and the Ohio River. By August, they had gathered a small group of new believers to the doctrine of Mother Ann Lee. Many of those converts had earlier been influenced by the zealous fundamentalist Cane Ridge Revival. In December 1806, forty-four converts of legal age signed a covenant agreeing to mutual support and the common ownership of property. They began living together on the 140 acres farm of Elisha Thomas, whose lands formed the nucleus of Pleasant Hill Shaker Village. Additional converts and property were quickly added, with the community eventually occupying 4,369 acres. By 1812 three communal families—East, Centre, and West—had been formed, and a fourth, North, was established as a “gathering family” for prospective members. On June 2, 1814, 128 Believers bound themselves together in a more formal covenant, which established the community in the pattern of the Shaker Ministry’s Village at New Lebanon, New York. We started our tour one crisp autumn day with lunch in the Trustees’ Office Dining Room, located in the Shaker Village Inn. We were seated in a narrow dining room, much like a porch in which glass doorways had been added. The original polished floor gleamed and waitresses served us a Kentucky entrée inspired by ingredients that might have been grown in the Shaker’s gardens. We topped off the hearty meal with Shaker Lemon Pie. On that fall afternoon, some of the buildings were not open, but we bought a tour ticket to see inside the Centre Family Dwelling and the Meeting House. Other visitors wandered up and down the lane that used to be Highway 68, winding through the middle of the property. Some of the buildings, such as Centre Family Dwelling and the Meeting House, are large. All are pristine, although they had fallen into disrepair and been used for other purposes after the Shakers left. Many of the buildings are painted colors, although the Meeting House is white. Centre Family Dwelling is built of limestone blocks. The Dwelling has four levels and 44 rooms, including fourteen bedrooms, a large dining room and kitchen, an infirmary, a meeting room (when inclement weather prevented them for attending worship in the large meeting house), and a basement for storage of dairy products and vegetables. Seventy to 100 men and women lived in Centre Family Dwelling as brothers and sisters, men on one side of the hallway, women on the other. In their dining room, Shakers ate in silent shifts, again, men on one side and women on the other. The group was work-driven, believing they worshipped as they toiled. Therefore, they wasted no time socializing at meals. Summer workdays began at 4:00 a.m. and went until 10:00 p.m. In the wintertime they started work an hour later and finished an hour earlier. The Centre Family Dwelling is almost 200 years old. Yet the hallways have original flooring and original wall paint. In the early 1800s, they lived by candlelight, so they built their buildings with large and tall windows for “borrowed” light that reflected off spotless white walls. Once the Shakers of Pleasant Hill determined to add a front porch on to Centre Family Dwelling. They made tall round columns to hold up its roof. However, the “Mother” village in New York frowned upon the idea. After all, no Shaker had time to sit on a porch! So the columns went into the center of the dining room, and two were cut in half lengthwise and incorporated into side walls—the only nod, except for a half-moon transom over the dining room doorway, to interior decoration in the building. In fact, the “Mother” village considered the Shakers of Pleasant Hill liberal. 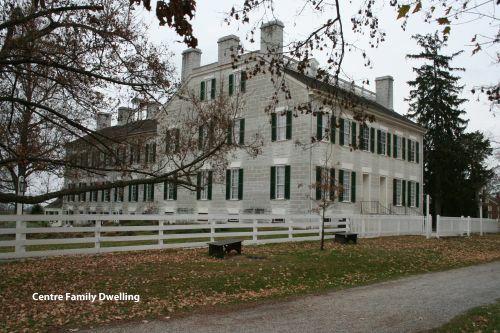 They did not approve of colored paint on their buildings, and strongly suggested that they paint the gray limestone of Centre Family Dwelling white. However, the Shakers in Kentucky saw no practical sense in painting over the limestone blocks. To become a Shaker, one committed to what they called the three C’s: celibacy, communal property, and confession daily. Children of adults converting to their way of life lived in a nursery and ate meals in a separate dining room. At age 21, children could decide whether or not to stay in the group. Shakers believed in total equality between genders and races. From the Ministry Village in New Lebanon, New York, four ministers were sent to the Shakers of Pleasant Hill, two men and two women. They lived apart from the families in rooms above the large Meeting House. To avoid any sense of favoritism among members of the congregation, the ministers ate alone in a small dining room in Centre Family Dwelling, and they had separate buildings for their workshops. Under the four ministers, the group had elders and elderesses, deacons and deaconesses. Every Shaker worked; some with distinct skills such as a cooper, blacksmith, woodworker, or weaver, did not rotate jobs. Others changed roles every six months. Their work created money-making industries and they shipped their products of jams, jellies, brooms, furniture, seeds, and herbs on river barges, and later, railroad cars, as far away as New Orleans and Cincinnati. At one time, the Shakers sowed 93 acres in broom straw. They understood row cropping 160 years ago, alternating crops in their fields. They sweetened their food with honey, but purchased sugar for the jams and jellies that they preserved and sold. Their profits went back into the community. Shaker Village buildings had glass windows long before neighbors around them. They imported a Durham short-horned bull from England, believing in improving the line of their livestock. The Shakers worked hard, but lived well. Records reveal that one sister owned 120 articles of clothing. Since the Shakers endeavored to create heaven on earth, they did not tolerate a speck of dirt in their environment. Their furniture had clean, simple lines and each piece had a function. No frills or embellishments were tolerated. Pegs on the walls organized their belongings, and also kept them off the floor for easier sweeping. They washed, starched, and ironed their clothing weekly. They bathed twice weekly, compared to the general population bathing twice annually. They washed their hands before meals or food preparation before doctors of that day washed prior to surgeries. The Shakers prospered with fresh, healthy food, hard work, and a clean environment. A doctor among their members promoted exercise and fiber in their diets long before it became today’s trend. The life expectancy in that community was 20 years longer than the general population. Their Meeting House, built in 1820 after their first one was destroyed by an earthquake, stands on sturdy concrete piers to withstand the vibrations of dozens of dancing feet during services. Built on the premise of a suspension bridge, the outer walls hold up the building. The meeting room is open space and has no pulpit. Men sat on one side, women on the other, and those moved by the Spirit spoke or read scripture. Although they had no musical instruments, they raised their voices in song and as the Spirit moved them, they shook their clothing and moved in boisterous free-form dancing and shaking. Benches lined the walls of the large meeting room, reserved for visitors in the area. The four ministers watched the proceedings from small windows above, observing their guests for signs of interest in joining their group. Our guide said the Shaker worship services could be heard three miles down the road. During the tour, we climbed stairs to the sparsely furnished second level bedrooms of the four ministers. The next set of steps reached the attic for observation of the notchedoakbeams that form the roof line. No nails or pegs were used in the building. Shakers from other villages traveled to Pleasant Hill to help construct the Meeting House. Although the Kentucky Shakers were poor people when they started the Village, they were skilled farmers and craftsmen. In 1852, a visitor noted that every article of Shaker produce sold for a third more than items from other farmers. They prospered, partly because of the high quality of their products, and partly because of their location for marketing. The Shakers were also diligent in seeking buyers for their products, sending certain men of their community as far as Louisiana and Ohio to hawk their wares. Over the years the Kentucky Shakers expanded their land holdings by acquiring adjacent farms for orchards and fields. They fenced the property with stone walls; many miles of the characteristic fencing stand today. According to another visitor in 1857, the Shakers had paid a hired man for twelve years to work fulltime at building stone walls. He had completed forty miles of walls at a cost to the Shakers of about $1,000 per mile. Their buildings were substantial, and well-built, and furnished with modern conveniences, such as pumps for running water in their kitchens during an era when most farm women carried water in buckets from a creek to their cabins. They were open to technology, continuously adapting and inventing methods and tools to make their work easier or better. Their mill had an elevator for moving grain to the upper floor, and they had a mechanical corn sheller. Shaker sisters also had the benefits of machinery for doing laundry by horse power. One of their barns included an upper floor for storage of grain and hay, a cutting machine for chopping fodder, and an ingenious railway for delivering feed to the cattle. In its heyday, Pleasant Hill Shakers had almost five hundred members. However, due to various circumstances, including the draining of resources during the Civil War, fewer that half that number lived there by 1875. The Pleasant Hill Shaker community was dissolved in 1910, having thrived for over 100 years. The Shakers were outstanding journalers. Without their records and written insights into their daily lives, their history would have died. Without the restoration of Pleasant Hill, the largest historic community of its kind in America would not exist for today’s generations to enjoy as a retreat from a bustling world. .
Shaker Village of Pleasant Hill, or Shakertown, as it is known by residents of . the area, is located 25 miles southwest of Lexington, in Kentucky’s Bluegrass region. The village is a nonprofit National Historic Landmark. Due to the historic features of Shaker Village, accessibility to guests with physical disabilities is limited. For information on overnight lodging, events, and activities, go to www.shakervillageky.org or call 800-734-5611.